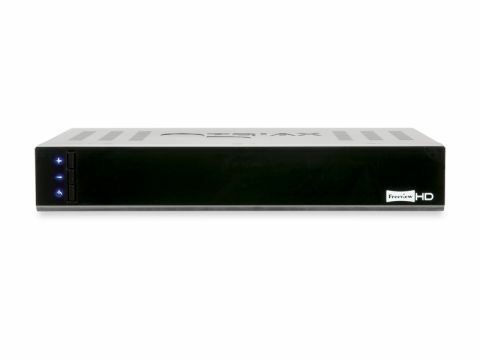 With similar dimensions to the average satellite zapper, the Triax T2-HD 115 looks not unlike the Triax TR 105's 'big brother'. Blue indicators accompany channel change and power buttons but if you're hoping for a proper LED display you're out of luck. The rear panel sports an HDMI 1.4 output (which includes an Ethernet channel) while two Scarts make archiving SD shows to a VCR/DVD recorder easier. Separate audio comes via an optical S/PDIF connector that currently outputs stereo only. There's also an aerial loopthrough, an unused Ethernet connector and a USB port for applying software updates. The receiver proves responsive to commands from a small remote whose familiar button arrangement works in its favour. The seemingly sensitive tuner made short work of finding channels including HD. Triax's distinctive red, white and black colour scheme has been incorporated into the interface, which can be hard on the eyes, though we found bumping up the menu transparency helped. The current channel is displayed on the right of the menu screen including the technical reception menu, which is fair stuffed with data (useful for installers, perhaps). Radio and TV channels are accessed from a main channel list or you can create a single favourites. Seven-day DVB data is displayed in a scrollable full-screen timeline programme grid of TV and radio channels. You can skip in two or 24-hour increments and synopses appear at the top. The programme info banner restricts you to browsing now-and-next data including synopses for the current channel and others without needing to switch over. HD pictures are sharp yet natural-looking and both HD and SD broadcasts can be upscaled to 1080p via HDMI with a slight detail boost. The Scart produces decent enough RGB results too, though composite, as expected, is softer. Audio from both TV and radio channels sounds clear, especially via the S/PDIF audio output. The HD 115 covers most bases as a zapper box and delivers decent picture and audio. But it lacks valuable features such as media playback and a CI slot as found on similarly priced products.